So we�re already starting to hear the talk that Duke could finish the 2010-11 season undefeated. Let me make this simple for you: it won�t happen. It hasn�t happened since 1976, and it�d take one heck of a team to accomplish the feat. UNLV was close in 1991�some say that was the best team to ever take the floor. Remember this same discussion about North Carolina in 2008? Not even close. Duke�s great and all, and yes, Coach K�s got the best team in the nation without a doubt. But they�re not going undefeated. I understand the ACC is the weakest it�s been in years, but an upset will happen at some point. It�s inevitable. 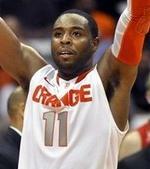 Syracuse hasn�t lost yet, but no Orange insiders are happy with the team�s play thus far. It needed to squeak out a victory at home against North Carolina State on Saturday�a team that lost by nearly 40 points at Wisconsin�and it�s struggled with guarantee games early in the season. Jim Boeheim�s team will need to bring it to knock off Michigan State. Memphis and Kansas are both 7-0, but they could easily have a loss at this point. KU edged UCLA after benefiting from a horrendous foul call that allowed it make a tie-breaking free throw with less than a second remaining. And the Tigers needed overtime to beat Arkansas State earlier this month. It�ll be all about tempo Wednesday night for these two teams. Vanderbilt�s got athletes, but on the road it�ll need to slow things down and let the Princeton offense go to work in the halfcourt. Missouri, of course, will need to make this a transition game to defend its home court. The Tigers don�t have anyone to match-up with Jeffrey Taylor� but then again, who does? Kentucky saw nearly its entire team foul out Saturday against North Carolina, and still only lost by two points. There�s serious depth and frontcourt issues for John Calipari, so we�ll see how UK handles an upstart Notre Dame squad. Neither team broke 50 points in last year�s meeting, a one-point win by Georgetown. You know Temple�s methodical offense won�t want to push the pace�but the Hoyas showed in an overtime win over Missouri last week that it�s not afraid to score. Old Dominion followed up a big-time win over Richmond at home with a loss to�of all people�Delaware. Those same Hens that haven�t been relevant since Mike Brey coached them beat the CAA co-favorite. How? Don�t ask me. Let�s just see how ODU responds against a strong Dayton squad. Bruce Pearl�s saga hasn�t affected his team yet, and it appears the development of Tobias Harris and Scotty Hopson could lead Tennessee to an East Division title in the SEC. Right now, the Volunteers look like the favorite, with Florida stumbling and Kentucky�s aforementioned issues. Jimmer Fredette scored approximately 106 points in Tuscon last year. He probably won�t go off like that again, but his BYU team will be a tough task for Arizona to topple. BYU doesn�t lose at home very much, and although Arizona�s been impressive, this might be too much to ask of Sean Miller�s guys.